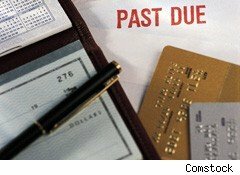 Although credit card delinquency rates still hover near record lows, more consumers are starting to fall behind on their payments. The national credit card delinquency rate (the ratio of borrowers 90 or more days past due) rose 0.71% in the third quarter, the first time since the fourth quarter of 2009, according to credit monitoring agency TransUnion. Average credit card debt per borrower rose $63 in the quarter, to $4,762. While the delinquency rate remains the second-lowest it has been in the past 16 years, the third quarter increase suggests that more high-risk consumers are opening credit cards, "as lenders have been gradually shifting their focus to the sub-prime market," Ezra Becker, vice president of research and consulting in TransUnion's financial services business, said in a statement. The good news is that the spike in the delinquency rate suggests that consumers who've been hit hardest by the tough economy are now gaining more access to credit, Becker said. However, a persistently bleak labor market could push credit card delinquency rates up further nationwide. "As the mean duration of unemployment in the country keeps growing, consumers are running out of financial options," Becker said. "At some point, if the underlying economic environment does not improve, this could be reflected in higher national and regional delinquency rates."